Kieran McCarthy in action during the second round of the West of Ireland at Easter. Photo Jenny Matthews/www.golffile.ieKinsale’s Kieran McCarthy recovered from a third round 77 to win the Munster Strokeplay Championship by the narrowest of margins. The championship veteran closed with a solid 72 to finish a shot clear of Dungarvan’s Alan Thomas and halfway leader Ian O’Flynn on four over par 292 at historic Cork Golf Club. Three-time winner Niall Gorey was nine strokes adrift of McCarthy on 301 after an accidented final day. The West of Ireland runner up admitted that he was “frazzled” as he signed for a third round 81, when he in fact shot 80, and then closed with a 75. The lowest round of the event was a four under 68 by Cork’s Eoghan Murphy in the second round while only McCarthy and Stephen Healy managed 69s on one of Alister MacKenzie’s classic designs. Three-time winner Niall Gorey (Muskerry) is lurking just four strokes off the lead in the Munster Strokeplay at Cork Golf Club. Hard practice is paying for Cork’s Ian O’Flynn who fired rounds of 71 and 70 to take a one-stroke lead over clubmate Ian Murpyy into the final two rounds of the Munster Strokeplay Championship at Cork Golf Club. Pat Murray, pictured at Baltray earlier this year. Picture: Thos Caffrey / www.golffile.ieHome favourite Pat Murray is on course to win the Munster Mid-Amateur Championship for the fourth time in six years after he added a 70 to his morning 74 to take a one stroke lead over Killeen Castle’s Mark Collins into Sunday’s final round at Limerick. Mark Collins, the new Munster Mid-Amateur champion. 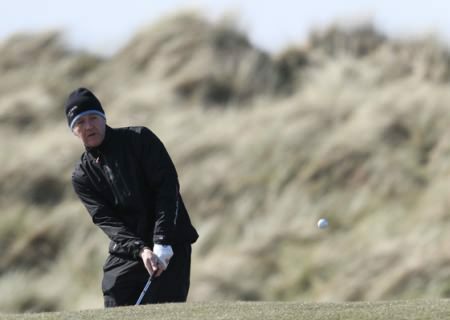 Pictured during the Irish Close at Connemara by Thos Caffrey www.golffile.ieKilleen Castle’s Mark Collins came from a shot behind three-time champion Pat Murray to win the Munster Mid-Amateur Championship at Limerick Golf Club. Shaun Carter was a model of consistency as he posted two round of 70 to win the weather shortened Munster Strokeplay Championship by two strokes on four under 140 at Cork Golf Club.